Using tea in cocktails is a fantastic way to bring new flavour and fragrance to a drink without having to fuss around with sweet syrups or fancy infusions. Plus, tea-based cocktails can be a healthier alternative to sugary mixers – need we say more? 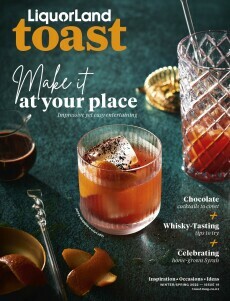 The lovely team at Fine and Dandy Teas has teamed up with Toast this week with two gorgeous recipes for tea cocktails that they've created with Peach Pitt Eatery and Bar in Auckland. They've also supplied us with Fine & Dandy gift packs to give away to three lucky Toast readers this week so you can get creative with teatails at home. Fine & Dandy is a brand committed to beautiful products and beautiful values – all teas are certified organic, fairtrade and are hand-blended to make sipping these delicious teas an extra special experience. Sound like your cup of tea? Click here to enter. Terms and conditions apply. Check out these beautiful tea-based cocktails below for some tea cocktail drinkspiration. Photography by Josh Griggs.